I say it pretty much every year and I&apos;m going to say it again. The most fun week of the year in Greater Lansing Michigan is finally here once again. 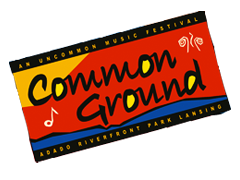 Yup - you guessed it - Welcome to Common Ground Fest 2012! During this music-infused and incredibly fun week in July we get treated to 7 nights of awesome outdoor concerts by big time acts of almost every genre. From country to classic rock to hip hop to &apos;80&apos;s and &apos;90&apos;s stuff they have the bases more than covered. I love the variety of this music festival because every single year, without fail, there is always at least two acts, where I&apos;m like, "Okay, yeah, that would be an awesome show!" And I&apos;ll be honest; I&apos;m pretty much a music snob. I don&apos;t just like any old thing coming out of the radio. But even with my discriminating tastes, I&apos;m always wowed when I see the line-up, this year is no exception. Another awesome thing about Common Ground is the price. Whether you get a Common Card and go for the whole week (highly recommended if you are down for a week long party - duh, who isn&apos;t?) or if you get a ticket for a single night the rates are like nothing you&apos;ll find anywhere else. I mean, you can get a 7-day general admission pass for just $99! That is simply a steal. If you checked out everything available to you that week, that would be like over 25 premium live acts for under $100 - that just doesn&apos;t happen, except at Common Ground, of course. I leave work each night I see people toting lawn chairs and meeting up with friends instead of the slow crawl home for another boring weekday evening. This is Greater Lansing having one big party and visitors of all kinds from all over are invited to stay the whole week! The weather is supposed to be sunny and wonderful every day this week, so this is it. You wanted summer fun? You got it. Thank you Common Ground for providing the soundtrack to another hot summer in the Capital city. For more information on Common Ground click HERE.